Some weddings are just dreamy and this perfect, winter wedding is a prime example of that. Brooklyn and Casey are two of the sweetest people you could ever meet. Both are kind hearted, soft spoken, and crazy in love with each other. It was such a joy to be a part of their beautiful day. They assembled a stellar group of talented wedding pros to make sure that their wedding went off flawlessly, and it totally paid off. Their amazing photographer, Katelyn of Katelyn King Photography, captured their day so beautifully. When you add a talented photographer to an already stunning wedding, magic happens. All of the photos in the blog post are from Katelyn King Photography. It was no surprise to us that both of Brooklyn and Casey’s parents were also extremely kind and so fun to work with! Both Brooklyn and Casey are close to their families, and we totally love that! (You can read more about why family is so important to us here.) Between parents and siblings, like Casey’s sweet sister who was his best woman and the little nieces and nephews that filled the wedding party, family was a main focus of their day. Originally, Brooklyn and Casey were planning for an outdoor ceremony under our pecan tree with an indoor reception. 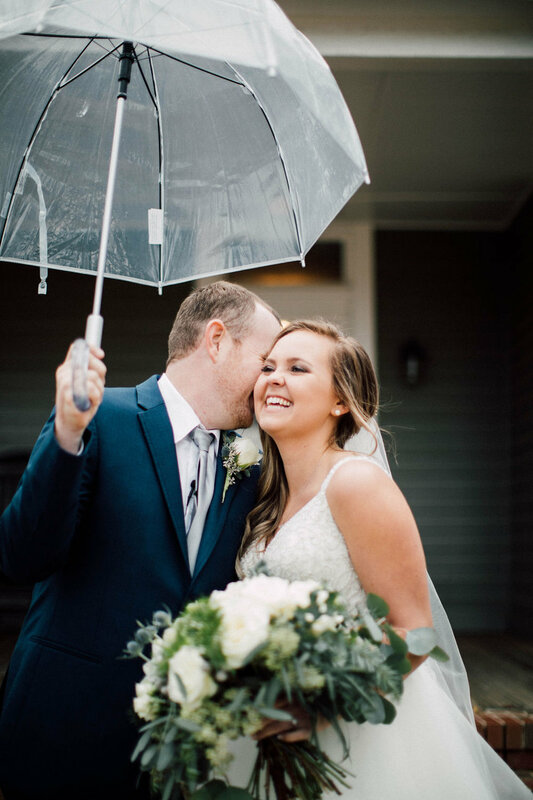 Georgia weather had other plans and a cold front came through right before their wedding. About two weeks before their big day they decided that to ensure everyone was comfortable they needed to have an indoor ceremony in our climate controlled barn. They choose to have an indoor ceremony with a full-flip, meaning they had ceremony seating and after the ceremony our staff flipped the barn into a reception space. Their ceremony decor was absolutely breathtaking. Their florist, Cyndi from Twigs, Leave, and Flowers, took their vision and ran with it to create an amazing backdrop for their vows. Five flocked trees filled the barn with a fresh pine scent, two overflowing floral vases adorned the entrance to the ceremony, and sweet signs that Brooklyn lettered herself announced the bridal party. It was intimate and truly perfect. Their reception, just like the ceremony, was a winter-wonderland. Cyndi created the most beautiful floral arrangements for centerpieces and decor. 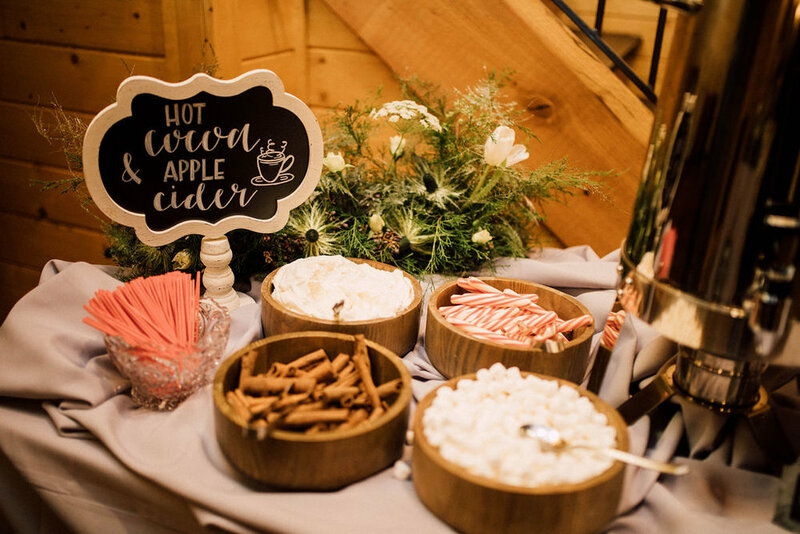 The Grand Gourmet, provide the delicious food (and the super fun hot cocoa bar). DJ Matticus Live kept great music playing all night long. Their PSB coordinator, Megan, kept up with the schedule and ensured that everyone was where they needed to be and everything ran smoothly. The beauty of a strong vendor team is that everything seems to run on its own but in reality each of these people and their staff is working hard to keep the night flowing. They catch any issues before it can even arise and they all communicate to make sure that the wedding is stress-free for the couple and their families. Their day was perfect and reflected their love so beautifully. We are sure that these two lovebirds have a lifetime of happiness ahead of them.